With Halloween just a week away, the Kingsport Police Department would like to offer some suggestions to potentially afford area residents a safer and more peaceful haunted holiday experience. K.P.D. Patrol Officers will be keeping an eye out on Halloween for anyone with mischief on their minds. Several laws and ordinances that are in force year around are particularly applicable to Halloween. Citizens are reminded that even on Halloween, it is unlawful in the City of Kingsport for anyone 16 years of age or older to wear a mask in public. Parents are urged to remind their teenagers that the State laws prohibiting vandalism also apply to juvenile acts such as rolling yards with toilet paper or throwing eggs at parked cars or houses. Even if no permanent damage is done, it is still considered criminal vandalism if the act causes the property owner an inconvenience by having to clean it up. It is also both illegal and extremely dangerous to throw any object at a moving vehicle. And those pranksters out there who find humor in frightening other people are urged to use some common sense and not take it too far. Remember that it is considered a criminal assault to intentionally or knowingly cause another person to reasonably fear imminent bodily injury or death. This typically would not apply if someone were to attend a haunted house or the like on their own volition. When it comes to candy collecting children, the Kingsport Police Department is a strong advocate of the “Trunk or Treat” and “Fall Festival” concepts as safer alternatives to traditional door-to-door Trick or Treating. Rather than having costumed kids wandering along dark neighborhood streets, knocking on the doors of complete strangers, Trunk or Treat and Fall Festival events are typically held in cordoned off and well-lit parking lots or enclosed venues and are sponsored by reputable business, churches, or other community organizations. Furthermore, most of these events also include food, games, activities, and/or costume contests. There will be several Trunk or Treats and Fall Festivals taking place throughout the Kingsport area in the coming days, giving kids multiple opportunities to sport their costumes and collect goodies. ● Cross the street at corners, using traffic signals and crosswalks. ● Look left, right, and left again when crossing, and keep looking as you cross. ● Put electronic devices down and keep heads up and walk, don’t run, across the street. ● Teach children to make eye contact with drivers before crossing in front of them. ● Always walk on sidewalks or paths. If there are no sidewalks, walk facing traffic as far to the left as possible. Children should walk on direct routes with the fewest street crossings. ● Watch for cars that are turning or backing up. Teach children to never dart out into the street or cross between parked cars. ● Children under the age of 12 should not be alone at night without adult supervision. If kids are mature enough to be out without supervision, they should stick to familiar areas that are well lit and trick-or-treat in groups. ● Decorate costumes and bags with reflective tape or stickers and, if possible, choose light colors. ● Choose face paint and makeup whenever possible instead of masks, which can obstruct a child’s vision. ● Have kids carry glow sticks or flashlights to help them see and be seen by drivers. ● When selecting a costume, make sure it is the right size to prevent trips and falls. ● Slow down and be especially alert in residential neighborhoods. Children are excited on Halloween and may move in unpredictable ways. ● Take extra time to look for kids at intersections, on medians and on curbs. ● Enter and exit driveways and alleys slowly and carefully. ● Eliminate any distractions inside your car so you can concentrate on the road and your surroundings. ● Drive slowly, anticipate heavy pedestrian traffic and turn your headlights on earlier in the day to spot children from greater distances. 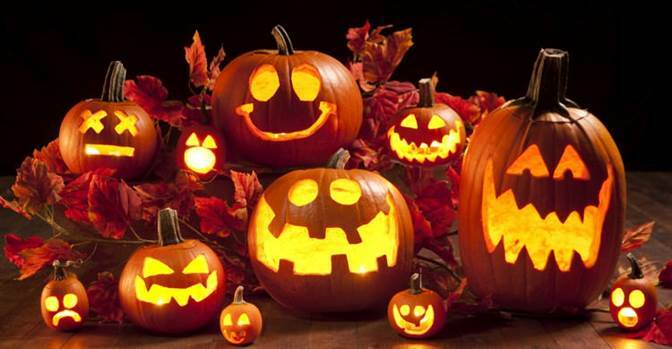 ● Popular trick-or-treating hours are 5:30 p.m. to 9:30 p.m. so be especially alert for kids during those hours. ● Don’t snack! Save the treats until you get home and can inspect the candy for loose or torn wrappers. Be cautious about keeping goodies that might pose as a choking hazard.